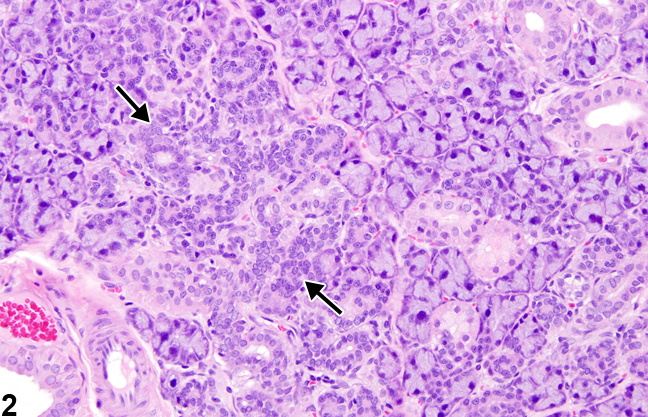 Normal submandibular salivary gland in a male F344/N rat from a subchronic study. 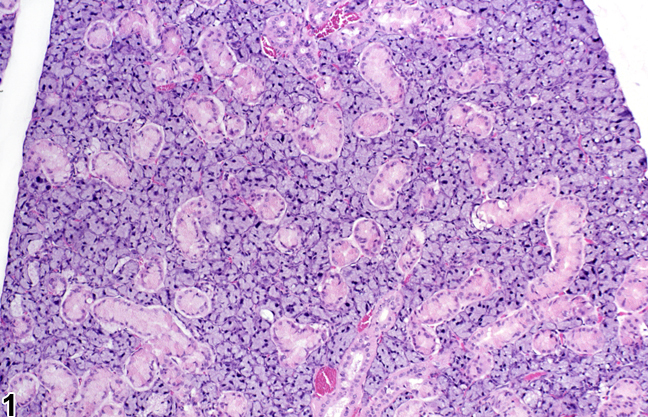 Salivary gland, Sublingual, Duct - Hyperplasia in a male F344/N rat from a subchronic study. 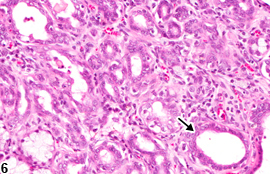 There is an increase in the number of ductular epithelial cells within the gland (arrows). 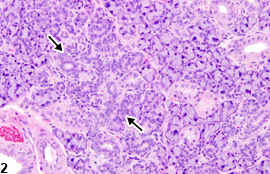 Normal salivary gland in a male F344/N rat from a subchronic study (higher magnification of Figure 1). 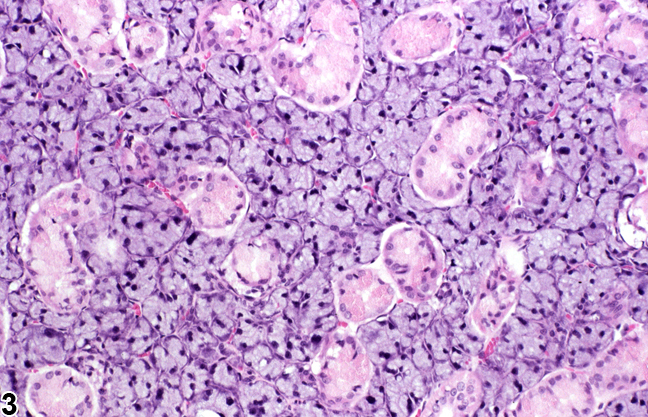 Salivary gland, Sublingual, Duct - Hyperplasia in a male F344/N rat from a subchronic study (higher magnification of Figure 2). 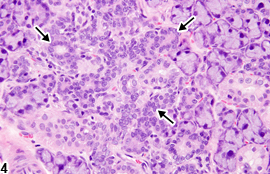 There is an increase in the number of ductular epithelial cells within the gland (arrows). 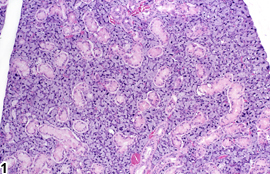 Salivary gland, Sublingual, Duct - Hyperplasia in a male F344/N rat from a chronic study. There is an increase in the number of ductal profiles within the gland. 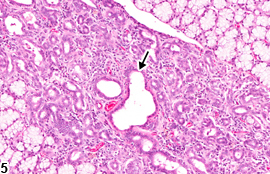 One duct is dilated and has an increased number of epithelial cells (arrow). 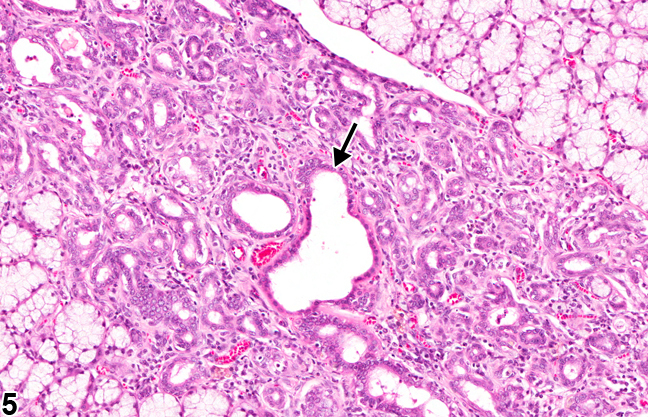 Salivary gland, Sublingual, Duct - Hyperplasia in a male F344/N rat from a chronic study (higher magnification of Figure 5). There is an increase in the number of ductal profiles within the gland. One duct is dilated and has an increased number of epithelial cells (arrow). 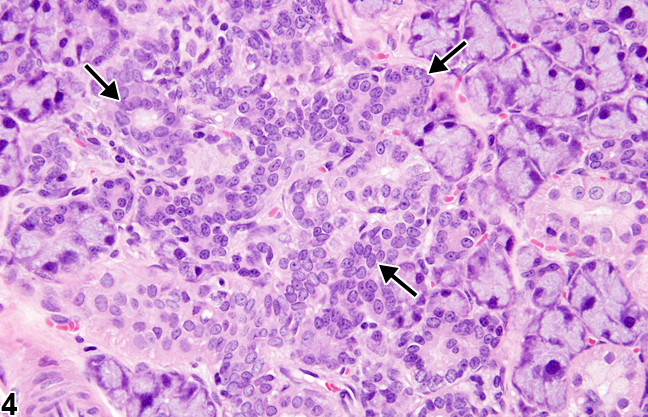 Hyperplasia of the salivary gland can be acinar, ductal ( Figure 2 , Figure 4 , Figure 5 , and Figure 6 ), or both. Hyperplasia of acini results in an increase in individual acinar units but not in ducts, whereas hyperplasia of the ducts is described as an increase in ducts without a concomitant increase in acinar structures. Often duct hyperplasia occurs in a salivary gland that has undergone tissue damage and appears to be a regenerative process ( Figure 5 and Figure 6 ). It is a common feature of many inflammatory and reactive conditions in the salivary glands of rodents, dogs, monkeys, and humans and can be associated with the presence of stones and calculi within the duct system. Regenerative hyperplasia of the ductal epithelium occurs in rats infected with the sialodacryoadenitis virus. Salivary duct hyperplasia can also be located in the ducts of the sublingual glands in the Wistar rat in the absence of obvious sialodacryoadenitis or evidence of any specific disease. Hyperplasia of the salivary gland should be diagnosed and graded whenever present. If the hyperplasia is limited to the ducts or to the acini, then the appropriate site modifier (duct or acinus) should be included in the diagnosis. If both the ducts and acini are hyperplastic, then no site modifier should be used, but it should be made clear in the pathology narrative that both components are affected. The modifier "regenerative" can be added to the hyperplasia diagnosis when the hyperplasia is occurring in areas of the gland in which there has been tissue damage. Severity grading is based on the size of the gland (lobules) or number of hyperplastic glands or ducts affected. 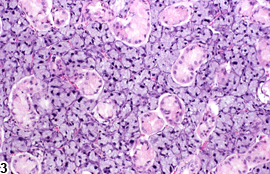 Associated lesions such as inflammation, fibrosis, or necrosis should not be diagnosed separately unless warranted by severity. Carthew P, Slinger RP. 1981. Diagnosis of sialodacryoadenitis virus infection of rats in a virulent enzootic outbreak. Lab Anim 15:339-342. Cotroneo E, Proctor GB, Carpenter GH. 2010. Regeneration of acinar cells following ligation of rat submandibular gland retraces the embryonic-perinatal pathway of cytodifferentiation. Differentiation 79:120-130. Cotroneo E, Proctor GB, Paterson KL, Carpenter GH. 2008. Early markers of regeneration following ductal ligation in rat submandibular gland. Cell Tissue Res 332:227-235. Reindel JF, Pilcher GD, Gough AW, Haskins JR, de la Iglesia FA. 1996. Recombinant human epidermal growth factor1-48-induced structural changes in the digestive tract of cynomolgus monkeys (Macaca fascicularis). Toxicol Pathol 24:669-679. Takahashi S, Nakamura S, Domon T, Yamamoto T, Wakita M. 2005. Active participation of apoptosis and mitosis in sublingual gland regeneration of the rat following release from duct ligation. J Mol Histol 36:199-205.